On our visit to Epcot at Christmas time last year, we stopped by the Japanese venue. The storyteller there was talking about the New Year's celebration rather than Christmas. That's because since there is only about 1% of the population that observes Christmas it is not an officially recognized holiday in Japan. Yet, there are seasonal decorations in the shopping areas and the Japanese have begun to exchange cards and presents. And Santa is seen on occasion. The really big tradition is to eat fried chicken on Christmas--all thanks to a successful marketing campaign back in the 1970s by Kentucky Fried Chicken. Now KFCs in Japan have lines streaming around the block as customers wait to pick up their chicken orders which range in price from $40-80. The New Year's celebration however lasts for four days. 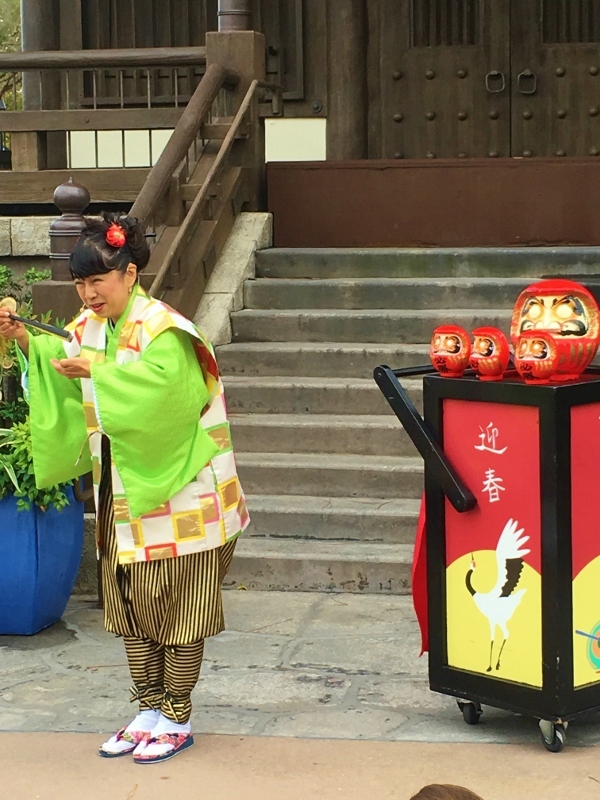 The storyteller at Epcot was cast as a Daruma doll sales person. The doll is almost egg shaped, made of paper mache and weighted on the bottom so it doesn't fall over. The eyes are blank. You paint in one eye, make a wish and when the wish is fulfilled you can paint the other eye in. The dolls are also considered a symbol of perseverance and good luck. They can be a gift of encouragement if instead of a wish, a goal is set by one eye and the other eye painted when the goal is achieved.